The 250 companies achieved combined sales of £66.7bn, an 18% increase year-on-year, record profits of £6.4bn, up 27%, and they employ a total of 435,000 people, up 10%. More than half the table, 126 companies, were not on the league table in 2017, including Boden, Dr Martens and Princess Yachts, and 64 firms feature for the first time. These companies feature alongside other established brands including Travelodge, Virgin Active and The White Company, and fast-growing brands such as Sushi Daily, Trainline and PureGym. Nine of the top 10 companies with the biggest sales are headquartered outside of London, including health food and supplements retailer Holland & Barrett and bookmaker Betfred. This year, 10 football clubs feature on the league table, including Arsenal, Chelsea and Everton, as the effect of Sky’s £5bn television rights deal is seen in company accounts. The top spot on the league table goes to The Watches of Switzerland Group. The jewellery and watch retailer owns Goldsmiths, Mappin & Webb, Watches of Switzerland and Watch Shop in the UK, and is expanding across America with the backing of private equity firm Apollo. Chief executive, Brian Duffy, led the acquisition of US chain Mayors Jewelers last year for $105m, which helped boost sales 21% to £685.2m in the year to April 2018, with profits rising 36% to £37.1m. 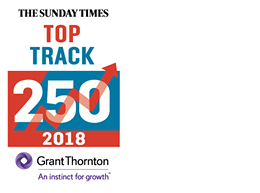 The Top Track 250 is sponsored by Grant Thornton and Lloyds Banking Group, and compiled by Fast Track, the Oxford-based research and networking events firm.